Poa compressa.Andrea Moro.Creative Commons.luirig.altervista org (Accessed 6/2014). 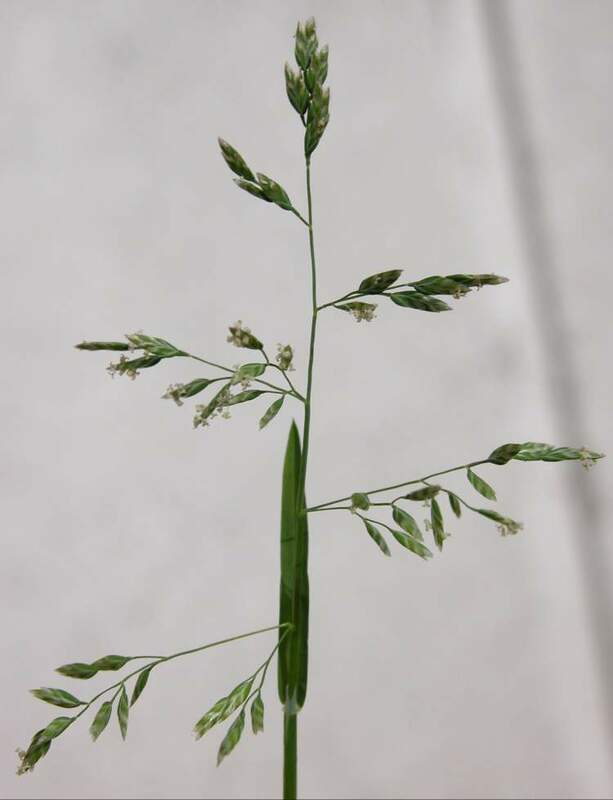 Poa compressa is a perennial C3 grass (Waller and Lewis 1979), erect, to 70 cm from long rhizomes, (not tufted), stems often appearing evenly spaced, sharply flattened, 2-edged, especially near top, stems leafy, somewhat dull, blue-green (Gargiullo pers. obs. ); late summer-fall basal leaves dark green, elongate (ca 45 cm long). Leaves alternate, 0.2-0.4 cm wide, stem leaves mostly 10 cm long or less, often held almost horizontally, appearing ranked, leaf tips boat-shaped, ligules membranous, short, 0.1-0.2 cm. Flower spikelets 0.4-0.6 cm, 3-6 florets, glumes about 0.2 cm, keeled, often with webby hairs inside; inflorescence 2-8 cm long, dense, compact, grayish-green, branches paired, bearing spikelets to near base of branches, May-June. Plants and seeds eaten by birds and mammals (Martin et al. 1951). Habitat: An escaped lawn grass. Common in lawns, open areas, meadows, roadsides, dry soil, pH 5-7. Tolerant of shade, moderately tolerant of drought, intolerant of fire, salt (USDA, NRCS 2010).